Two weeks ago, I discussed the inspirations for a Greek Philospher mask. Last week, I showed how this mask was built up. 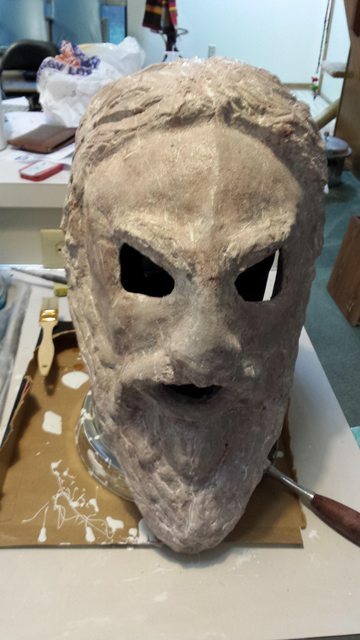 This week, my Greek Philosopher mask will be completed with the addition of paint and lacquer. The ‘stone’ surface of the Greek Philosopher mask was painted to look similar to marble. To do this, I first set about finding what sort of marble I wished to imitate. In keeping with the faux-historicity of the mask, I decided to base the colors in the marble off of that which was available in the Hellenistic period. Additionally, I wanted to give the stone an aged appearance which fits with the thematic elements discussed in the inspirations post. 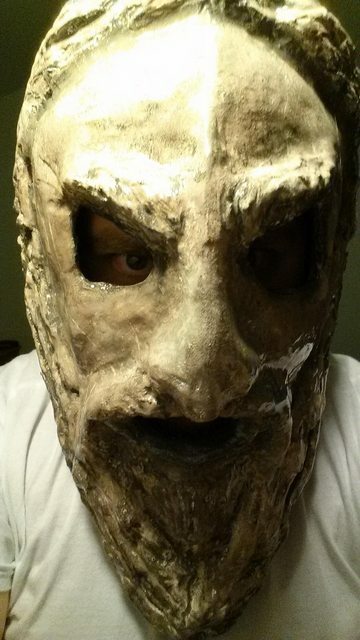 My Greek Philosopher mask was to be made of material which imitates discolored Parian marble. Marble from the island of Paros is recognizable as a uniform, crystalline white marble (Washington 1898). The picture below depicts a magnified image of Parian marble. While no marble ages the same, generally Parian marble ages in such a manner to produce a distinctly orange-hued discoloration. This is possibly due to sub-surface oxalate migration or formation (Pinna 2015). Below are some pictures of discolored Parian marble. 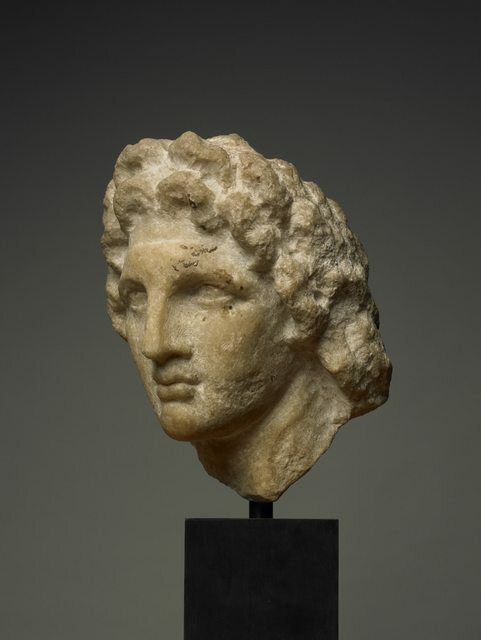 The first is a bust of Alexander. 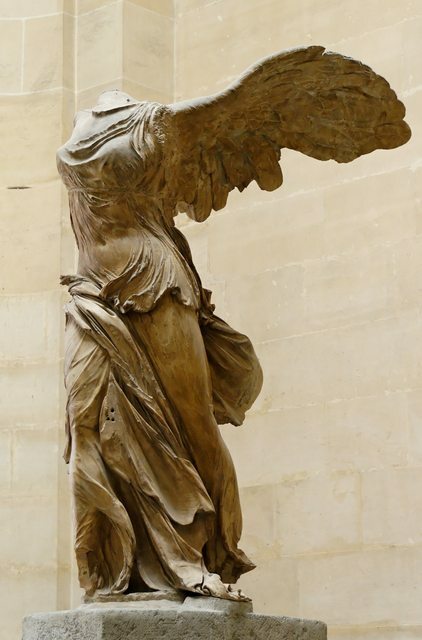 The second is Nike of Samothrace. The hues present in Parian marble statues is distinct from other sources from the area such as Carrara marble. 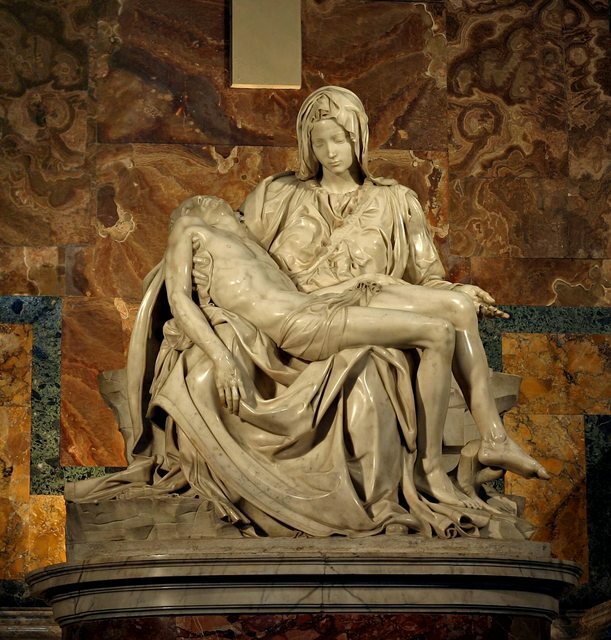 This is the material used in several recognizable sculptures, such as Michelangelo’s Pietà (pictured below) and the Elgin Marbles. These figures often take on a more gray-hued discoloration with age. This is possibly due to fungal and/or bacterial growth on the surface (Marvasi 2008, Konkol 2009). To produce the marble effect I wanted, I used a variant of a technique called Scagliola. To employ this traditional method for my modern Greek Philosopher mask, I mixed white latex paint with plaster of paris and acrylic paints which acted as pigments. While the surface was wet with the paint, I drew in paints of another pigment to form lines. Then, the light tone of the first few coats was given a dabbed on patina with warm-toned grays and browns to mimic approach the aged Parian marble look I wanted. Finally, carbon soot was rubbed on the dried paint. After the painting was complete, I added highlighting by marring the surface. A nail was used to scratch the painted surface down to the bottom layers of the scagliola (beneath the dabbed gray, brown, and carbon). 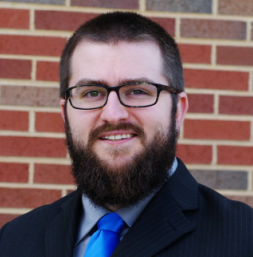 These scratches were added in the recessed corners of the surface such as the beard and hair. Additional scratches were added in a haphazard fashion to the smoother surfaces. By using the scratches on the surface, a more aged look is achieved. Applying the scratches to recesses of the surface of the mask mimics the patterns of marble which has been discolored due oils from the skin rubbing on the surface. As the Greek Philosopher mask was intended to be functional, the completed surface needed a sealant to prevent the paint from being removed or damaged during wear. Several coats of a water-tight lacquer was applied to the mask. This would prevent spills or rain from damaging the surface, and it would prevent sweat from damaging the interior. The lacquer I used gave the mask the appearance of a polished sheen. If I was to attempt this again, I am not certain I would use a glossy lacquer, as a matte coat might have been more appropriate for a stony surface. The complete mask was officially shown to the public at Halloween party. 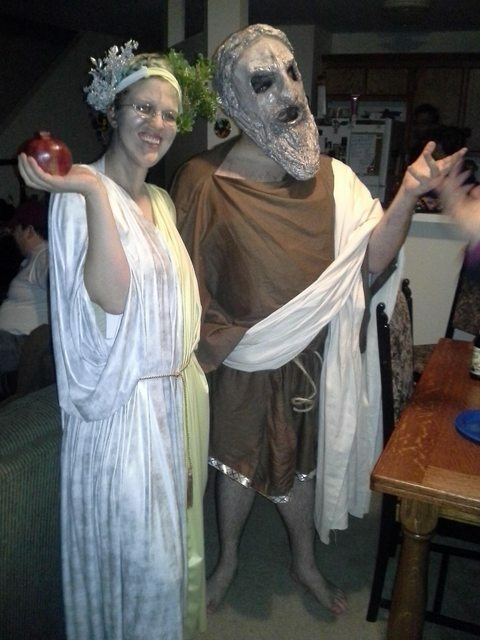 Accommodating the wish of my date for a couple’s costume, I dressed as Hades and she as Persephone. The entire costume was a hit, the mask especially. I admit, I still wear the mask from time to time. Since this is one of my favorite works, I find it hard to resist popping it on for a good session of pondering. Washington, Henry S. “The Identification of the Marbles Used in Greek Sculpture.” American Journal of Archaeology, vol. 2, no. 1/2, 1898, pp. 1–18. JSTOR, JSTOR, www.jstor.org/stable/496773. M. Marvasi, F. Donnarumma, A. Frandi, G. Mastromei, K. Sterflinger, P. Tiano, B. Perito, Black microcolonial fungi as deteriogens of two famous marble statues in Florence, Italy, In International Biodeterioration & Biodegradation, Volume 68, 2012, Pages 36-44, ISSN 0964-8305, https://doi.org/10.1016/j.ibiod.2011.10.011. 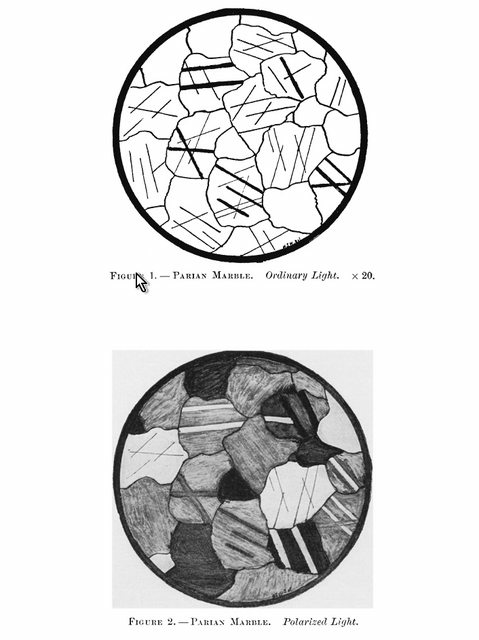 Nick Konkol, Chris McNamara, Joe Sembrat, Mark Rabinowitz, Ralph Mitchell, Enzymatic decolorization of bacterial pigments from culturally significant marble, In Journal of Cultural Heritage, Volume 10, Issue 3, 2009, Pages 362-366, ISSN 1296-2074, https://doi.org/10.1016/j.culher.2008.10.006.